Food has been a large portion of this month's issue especially as it pertains to keeping things fresh as we are in the beginning stages of enjoying all that is Spring. We've been fans of Claire Thomas' Kitchy Kitchen for awhile and chatted with the new mom about Farmer's Markets, her latest cookbook Sweet Laurel and how she stays creative with meals for her family includings pets, Mochi and Buster. 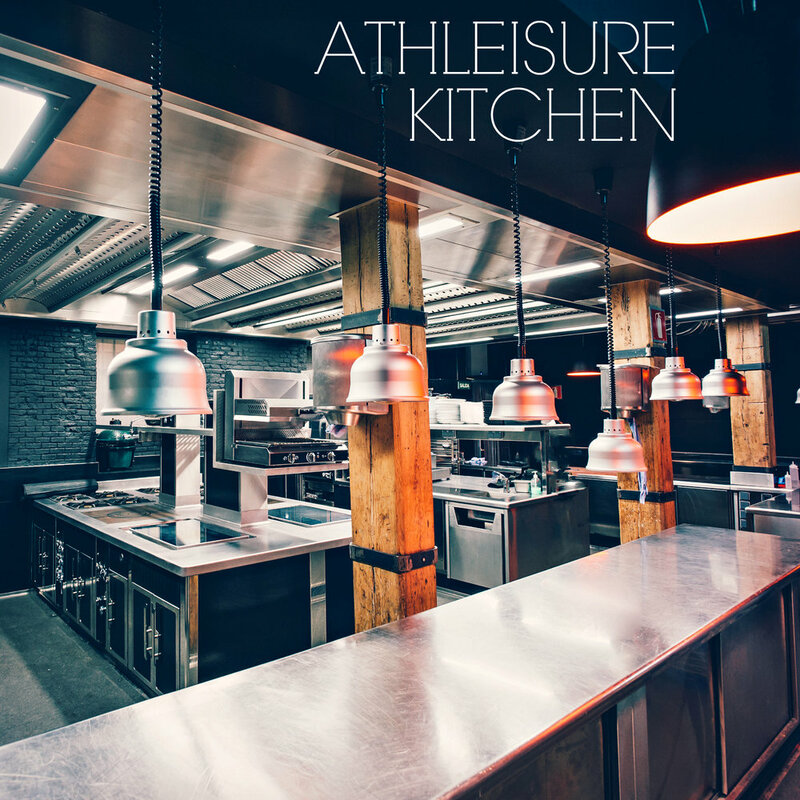 ATHLEISURE MAG: Can you tell us about your journey in the culinary world as in researching you, we realized that you have been involved in a number of areas! CLAIRE THOMAS: Thank you so much! I started the blog The Kitchy Kitchen 10 years ago and my focus was on ingredient driven, simple food that was delicious and easy to prepare. Now that I am a new mom, that is more important than ever! It needs to be delicious but it needs to be done. I need to be able to put it together pretty easily. Because of my background in photography as well, the food needs to be really beautiful as well. I do think that the cliché is true, we eat with our eyes first. AM: The Kitchy Kitchen, what was the thought behind coming up with that? CT: I grew up in a food family, my mom was a great cook. I grew up in Southern California where I was surrounded by a lot of great produce. I’m so lucky to have the great home that I have. I honestly was just inspired by the food world around me. I am also a huge Food History nerd so that was a part of it. But it was really about creating recipes that I was passionate about and that made people’s meal times a little easier to get inspiration for your home cooking. I love home cooking, I myself am a home cook and I think that it can be just as good as restaurant food. AM: As you’re such an aficionado on this topic, here in the East Coast, we keep getting teased with the notion of Spring which doesn’t quite get here. What are 3 easy to make dishes that we can make at home that get us to this season even in the midst of the flip-flopping weather? CT: One of my favorite things ever is a tartine which is just a fancy way of saying, an open faced sandwich. I’m from L.A., the land of avocado toast and I’m sure that this is familiar to everybody! For me, the idea of creating new recipes and trying something new can be a bit stressful for people. You have a new recipe and you’re thinking, “oh gosh, what if this doesn’t work – I don’t know?” I like the idea of taking something that you’re really confident with or familiar with and just adapting it a little bit. In my case, the tartine or open faced sandwich, I took ingredients I know like cream cheese – that full fat, it’s so delicious and then smoked salmon which is so beautiful and such a classic combo and then I add things like fresh lemon zest and fresh herbs chopped into the cream cheese. All of a sudden, it’s a completely different flavor profile. It’s elegant, it’s elevated, but it literally took 30 seconds. I do that with my food, my family’s food and even my pet’s food. I really think that whole delicious ingredients is so important for everybody. AM: I love the tartines – do you have 2 other quick and easy items that can be made? CT: I am also a big fan of scrambled eggs and being a mom I basically have 5 minutes to whip things together. Eggs are just a really brilliant canvas. So I’ll do things with scrambled eggs where for instance, if I have cheese left over from a cheese board – so fancy cheese, you can grate that in or melt it into the eggs and all of a sudden it has a completely different flavour, it's really delicious, it's also beautiful topped with things like fresh pro, it's really delicious, it's also beautiful topped with things like fresh prosciutto – and honestly, I’ve done ones where I have added a little bit of orange juice which is kind of an unique idea but my aunt from Australia showed me that and it adds a really beautiful brightness. So that’s one of my easy breakfast moments. For dinner, I love pasta but my husband is paleo, so I had to come up with a few options there. I know everybody knows about zoodles doing zucchini noodles and sweet potato noodles. I really love doing sweet potatoes that have been sliced thinly, but in sheets so that you can make lasagna with it. I love doing a nut milk cheese if you are trying to go dairy free as well. It’s really easy to put together as well. I have my second cookbook that just came out that I co-wrote with my dear friend, Laurel Gallucchi, it’s called Sweet Laurel. It’s all grain free, refined sugar free and dairy free baking recipes and you can find our recipe for our own Nut Milk Cheese, Everything Bagel Bread, pies, cakes, but they are all completely paleo and grain free. So I have been using that a lot for my husband’s meal. AM: That’s fantastic, when it comes to your home, because we spend so much time running around so when we want people to come over and to have your friends and family with you, what should people have on hand whether you’re watching a game at home, brunch or a girl’s night in? CT: I love that and it’s such a good point. For me, I’m so bad and my brother will come over and open my fridge and will say, “you have no snacks,” and I will say, “I know, I have a million ingredients though, so let’s make something.” One of my favorite things that I like to call my Lazy Hostess Recipes because you get to look very fancy and put together, but it takes about 10 seconds. My favorite thing for movie nights, because I love Movie Nights, is I take out my air popper and, I let people pop popcorn as they need but then I set up my table where I basically clean out my pantry. I have all those flavored salts, different types of olive oil, brown butter, melted butter, truffle oil – all those things so that people can make their own DIY popcorn and it’s fun because all I have to do is put things out and I don’t have to do anything! So that’s the trick! So I’m actually not even making anything! it’s for friends, for family or my cat Mochi. AM: How do you juggle your schedule and keeping meals creative? CT: Dinner time is getting kind of hectic as we have our 8 month year old son now in the mix, we have our 2 pets and everybody eats at the same time - pets included. For me, I saw that I had eaten my 1,000th bowl of cereal and I was getting kind of bored with what I was eating and then looked over and saw Mochi eating out of her bowl and then I thought, "well my goodness," she eats the same thing everyday too. So, I was really excited when I came across the Purely Fanciful Feast Filets because they are a whole ingredient snack which is beautiful compliment to Mochi’s meals. Now that I am a mom, I literally read the nutrition menu to see what’s in it. I was really blown away by how simple the filets were. They were beautiful for my cat and Mochi was my first pet so she’s my fur baby so I want to make sure that she still feels like she is getting love and attention. So, the filets are a really great way to do that. So, I just flake them off, sprinkle it on top of her regular food and all of a sudden it’s new and exciting OR I just let her snack on it like a whole filet – while she likes it like that. So, I kind of take a similar vibe with what I am doing with my own food. I use recipes that I am already confident with that I know how to make and then I just do a little adjustment – let’s add some new ingredients to the mix, what herb can I do that’s different then what I’ve had before? Things like that are small tweaks that take 30 seconds to do but all of a sudden it tastes really different and it’s not the same old same old. AM: Being someone that is so creative, how do you maintain your creativity to bring it across the range of projects that you have going on? CT: For me, it’s about finding inspiration in the world around me. For me that means, if I’m in a rut, I go to the Farmer’s Market and it’s spring time. Here in L.A., it’s 85 degrees and I know that in the rest of the country, it’s like Spring is eventually coming. When it finally arrives, it’s Farmer’s Market season! It’s across the country and they’re popping up everywhere. I love going because the best kept secret is that farmers actually know how to prepare their food better then anyone. If you talk to a farmer and you say, “what do you do with these carrots?” They’ll tell you and it’s usually something super simple and it’s usually different then what you would expect. They may shave it really thinly and put it in a salad because that specific kind of carrot has a really fabulous crunch and is already very sweet. So I love going to the Farmer’s Market, and I love eating which sounds silly but to be a good cook you have to be a great eater. So if you’re in a rut, go ahead and eat, try something new, a cuisine you haven’t had before, try an ingredient, be adventurous that way, I think you can inform the food you make at home. Because adding a sprinkle of something or sometimes just reshuffling the deck in terms of how you incorporate the ingredients, that can make a huge difference. I feel that way about the food that I make for myself, but then also for Mochi and Buster, my dog’s food as well. I want to make sure that they are eating whole ingredients that makes them feel great because they are part of my family too. AM: Do you have 3 favorite veggies as I had to ask! CT: Well right now, it’s so fun as I have the veggies that I eat all the time because of my husband being paleo. So it’s like sweet potatoes is literally 90% of what we eat right now. Other than that, I’d say that in the season, right now everything is so fresh, bright and green. English peas is probably one of my favorite things in the world – I love doing a smashed pea tartine as they are the new avocado toast as that’s what I have heard. It’s so delicious, fresh and sweet. Zucchini blossoms are coming in so stuffing those with different types of fillings like a veggie quinoa filling, a nut cheese if you are trying to keep things a little lighter. Another veggie that I am really loving is Romensco, which looks kind of like a psychedelic cauliflower if you look at it very closely. But it’s beautiful with bright colors and when you roast it, it’s like candy. So that’s one of my favorite things to serve as a side with meals. AM: Fantastic, where can we find out more about you and everything that you have going on? CT: Absolutely, please check out TheKitchyKitchen.com for more information on my recipes, my DIY’s, my family content and then to find out more about Mochi’s new favorite snack, please check out FancyFeast.com/FiletYourWay. Read more from the April Issue and see Kitchen Creative with Claire Thomas in mag.